Tiamo De Vettori found out that his manager had been working with the mafia behind his back, to guarantee he would become an overnight “rockstar” sensation. Upon finding this out, that same day, Tiamo quit his music career, moving to Arizona out of safety fears. But the allure of music was too strong, and eventually he went back to San Diego to rebuild his career without a manager, winning L.A. Music Award’s “Singer/Songwriter of the Year” award, releasing his first album and beginning to create his own path. Of course, having left the security of a manager and agent, he also lost any funding or financial support. That left him on his own to figure out how to make a living. It took a couple of years, but as his fan base grew, his income did as well. During that time, he worked as a “Liger” mascot, making $8/hour. He became incredibly discouraged and quit music again after getting booked at his dream venue in San Diego, and promoting that “comeback concert” for 6 months, only to have 2 people in the audience. A year later, at a seminar, he spontaneously asked the event coordinator if he could perform onstage, and performing in front of that audience of 3,000 people, he realized he could do Keynote Concerts, where he could combine speaking, storytelling and live music. The first month after quitting his day job to do music full time, he made $20k and was booked for his biggest gig to date in front of 15,000 people. He never looked back. Realizing how he created his own success, he started teaching and inspiring other music artists how to create their own success and destiny, so they did not have to rely on labels, managers or agents. In addition to great success with his online program, he started leading live seminars and year-long masterminds for musicians and speakers. Tiamo has been featured on ABC, NBC, CBS, MSNBC, Fox, to name just a few. Just a few of his clients: Jimmy Kimmel Live, Hewlett-Packard, The Big Shift Experience (Bill Baren event), Coaching Business Freedom Retreat (Christian Mickelsen event), Message 2 Millions (Ted McGrath event), Speak to Sell (Lisa Sasevich event), and many more. 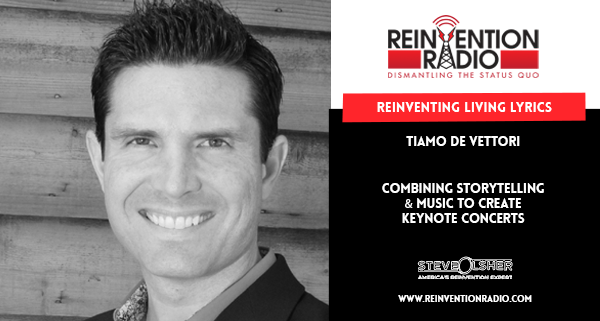 TUNE IN to this episode as Tiamo chats with Steve, Mary and Richard about living lyrics and how he combines storytelling and music to create keynote concerts. Reinventing the Small Stuff – In this episode, Kristine Carlson chats with Steve, Mary and Richard about reinventing the small stuff, how not to sweat it and live happy.